Anyone else feeling festive already? I usually don’t join in ‘til a little later in the year, but all the designing and market prep I’ve been doing has me in the mood for all things holiday! I officially can’t wait for all the new holiday movies headed our way via Netflix and Hallmark, but for the time being, I’m rewatching some of my old favorites and enjoying fall while it’s still around. Read on to see what I’m loving for November — and remember, you can join the mailing list for more illustrated goodies straight to your inbox! All these delicious, food-inspired colors! This palette makes me so happy — it’s both earthy and festive, and inspired by some of my favorite Thanksgiving flavors — especially my favorite cranberry scones! All the Thanksgiving food! The color palette above might have tipped you off already, but Thanksgiving is my favorite holiday, and it also happens to include some of my all time favorite foods — roasted turkey with gravy, green bean casserole, pumpkin pie (oh my!). Who’s with me? The fall issue of Magnolia Journal, because, let’s be honest — I’m obsessed with everything Joanna Gaines does. 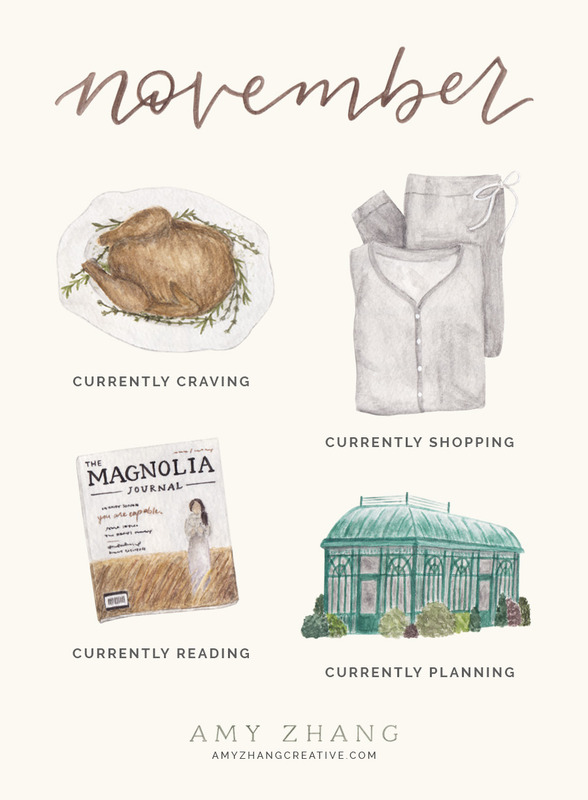 I definitely read every issue of the Magnolia Journal multiple times throughout each season, and I’ve been revisiting fall 2018 recently as I wait for the next issue! Holiday markets! We’ll be at a couple big holiday markets around Denver this month (the Junior League Holiday Mart and the Botanic Gardens Winter Market), and I couldn’t be more excited! Looking forward to the festive shopping and spending time around other local makers!